Exhibitor Profile : Gemstones (Precious stones, semi- precious stones, rough stones, other stones) Diamonds, Pearls, Precious Metal, Synthetic Stones, Fashion Jewelry, Fine Jewelry, Gold Jewelry, Silver Jewelry, Display & Packaging, Equipment & Tools, Jewelry Parts, Machinery, etc. Visitor : Importers, Manufacturers, Trading Companies, Distributors, Wholesalers, Retailers, Boutiques, Fashion Showrooms, Department Stores, Buying Agents, Designers , etc. 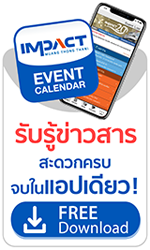 Trade Visitors: February 20-22, 2019, Time: 10:00-18:00 hrs. Public Visitors: February 23, 2019, Time: 10:00-18:00 hrs. Public Visitors: February 24, 2019, Time: 10:00-17:00 hrs. Almost 200 selected restaurants from across the country will present their signature dishes during the "AOVA Presents Krua Khun Toi Expo Season 4" Organised by Krua Khun Toi, a TV variety show, which has recommended delicious dishes.